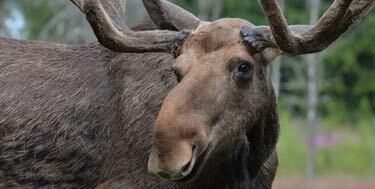 Our Moose is called an Elk in Europe. A gang of angry drunken elk barred a man from entering his home in suburban Stockholm on Tuesday, leaving the frightened homeowner no choice but to call police for help. “Five drunken elk were threatening a resident who was barred from entering his own home,” read an incident report on the website of the Stockholm police department. The author of the report confirmed that the homeowner, who lives on the island of Ingarö in Stockholm’s eastern suburbs, was justified in calling the police for help. “I’m not surprised that he called the police when he was faced with a gang of five drunken elk,” police spokesman Albin Näverberg told The Local. The incident involved four adult elk and one calf, Näverberg explained, all of whom were intoxicated after having eaten fermented apples that had fallen from the homeowner’s apple tree. “Police who arrived on the scene reported that the animals had been warned that the police were on their way and wisely decided to leave the address,” the report read. The homeowner was instructed by officers to clear his yard of fermented apples in order to avoid any future incidents with drunken elk gangs. According to Näverberg, Tuesday’s run-in wasn’t the first time drunken and aggressive elk had caused trouble for the homeowner. “A couple of years ago a single drunken elk chased his wife from the yard into the house. She had to bolt the door,” he said. Drunken elk are a recurring nuisance for homeowners near Stockholm, explained Näverberg, who estimating that police can receive “dozens” of reports in the autumn when apples and fruit from other trees begins to fall. “If there is a lot of fermenting fruit, then we get a lot of calls about drunken elk. But most often they’re gone before officers arrive,” he said.